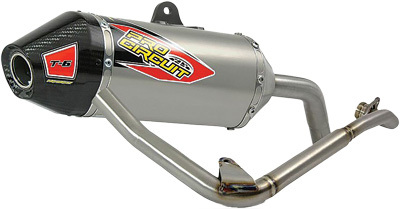 Honda Grom needs a little kick to get up and going so an easy way to get this extra power is with performance exhaust. Plus an added bonus of a real motorcycle sound. Pro Circuit gets it done at a reasonable price with a full system that includes a stainless stell header pipe with a Carbon Fiber tip for that cool style. The Pro Circuit will also lighten the load for more top end with better bottom for a fuller experience. A must when changing intake manifold and throttle body.